This post is brought to you by eureka!® Organic Bread. I have a couple of friends who don’t love brunch. Blasphemy, right? I love a late, long, lazy brunch, when time allows. Ninety-nine percent of the time, I’ll opt for a savory option. 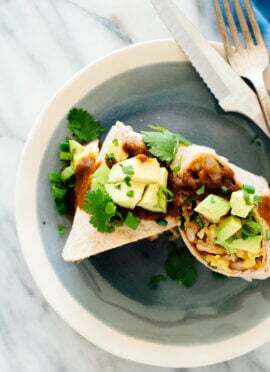 There’s so much room for creativity when it comes to standard vegetarian breakfast/brunch ingredients: eggs, toast, veggies, tortillas, beans, etc. The possibilities are endless, and I have a few favorite local restaurants that offer creative veggie options. I’ve been thinking about the standard egg and toast brunch option, and came up with my own version that is neither bland nor boring. I whipped up an avocado-based pesto spread in my food processor. It’s infinitely more exciting than a pat of butter (sorry, butter!). 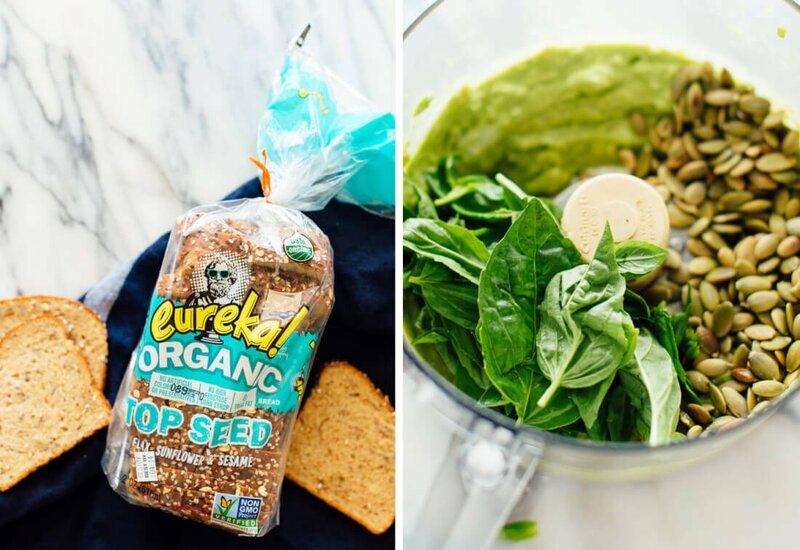 Toast can only be as awesome as the bread used to make it, so I opted for my favorite store-bought organic whole grain sandwich bread, which is made by eureka! Organic Bread. I found it at the nearest grocery store to me. 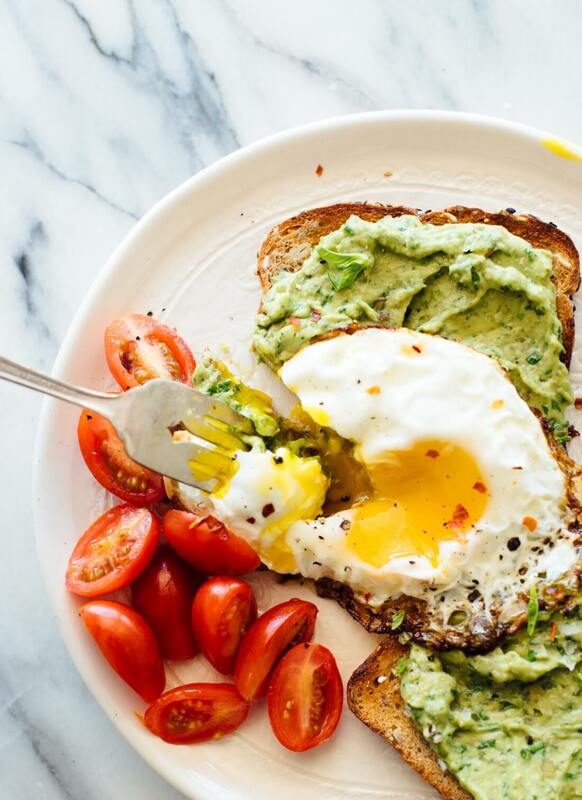 This simple avocado toast is delicious as-is, or you can top it with eggs and a handful of sliced cherry tomatoes. Either way, it’s a great snack, breakfast/brunch, lunch or dinner. 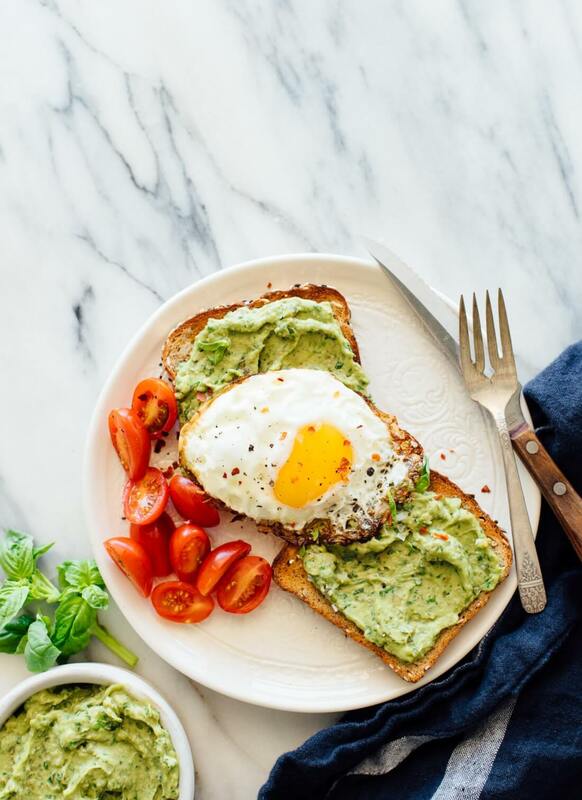 This avocado pesto toast recipe is fantastic for breakfast, brunch or any time of day, really! Serve it as-is or add eggs and tomatoes for a complete meal. Recipe yields enough for 4 toasts, or 2 to 4 servings. To toast the pepitas, pour them into a small skillet. Cook over medium heat, stirring frequently, until they are making little popping noises and starting to make little popping noises. Transfer to a bowl to cool. 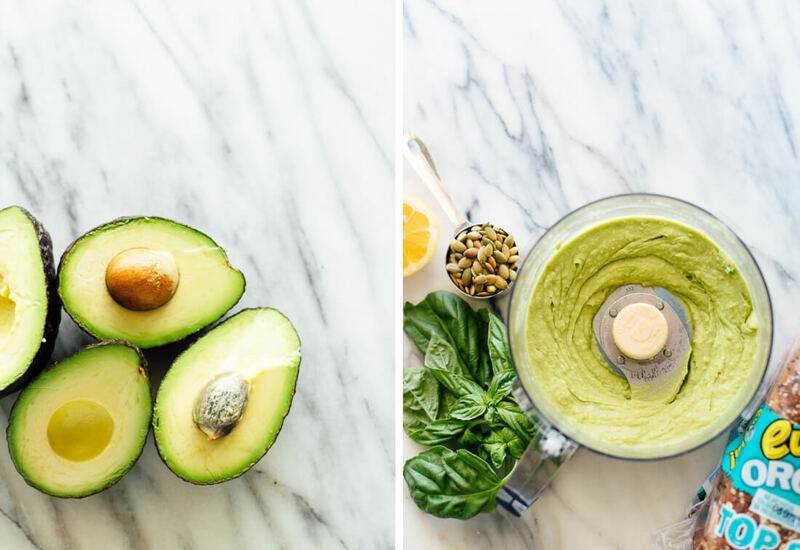 To make the pesto, pit and halve the avocados and scoop the insides into the bowl of a food processor. Add the garlic, lemon juice, and salt. Blend until smooth, pausing to scrape down the sides as necessary. Add the toasted pepitas and basil leaves and pulse until the pepitas and basil are broken down into very small pieces and the mixture is well-blended. Taste, mix in more salt if the mixture doesn’t taste totally awesome yet. 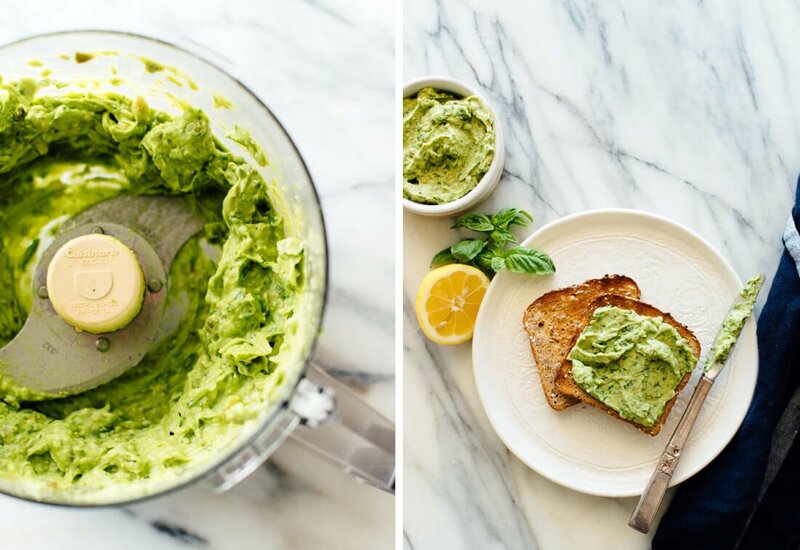 Toast the bread, then spread a generous amount of avocado pesto over each slice. Serve as is, or with eggs and/or tomatoes. Sprinkle lightly with freshly ground black pepper, red pepper flakes (for heat) and/or flaky sea salt, if desired. Serve immediately. Make it vegan: Skip the eggs! Storage suggestions: The spread yields about 1 ½ cups, so you might have some extra. Leftover spread will keep in a small bowl with plastic wrap pressed against the top in the refrigerator for two to three days; scoop off the top layer before serving if turns brown. This blog is sponsored by eureka! Organic Bread. The opinions and text are all mine. Thank you for supporting the sponsors who support C+K! This is literally my favorite type of breakfast/brunch. I add smoked salmon to the mix, too — just ’cause. It’s super customizable, I love switching up toppings! I notice you like to use these hulled pumpkin seeds a lot, Kate. Could you tell us where you get yours from? Also, is there an alternative that works just as well? Thanks. This recipe looks delicious. Can’t wait to try it. Hi Emma, yes, I love pepitas! They are available at quite a few grocery stores now (either in the nuts section or health food section), and all health food stores have them. Check the bulk bin sections, too. They have a distinct flavor but probably the closest thing would be sunflower seeds. Thank you for the crock pot suggestion. I honestly never cook with a crock pot because I prefer the flavor that comes from sautéing onions, garlic, etc. in a soup pot. I just got an Instant Pot and it has a sauté setting so I may use that. I think I’ve heard that my lentil soup turns out well in a crock pot, if you’d like to give that a try. This looks awesome! I love avocado and pesto and like the idea of not adding oil, but having the healthy fat of the avocado. I love nut and seed bread, too, and Eureka has some delicious variations. Nothing ruins an avocado toast like bland bread. I hope you try it! I love that all of your recipes are so simple, but have unique twists like this one! I would have never thought to make an avocado toast variation like this. So creative! Sounds delicious! I might try substituting some preserved lemon for the lemon juice. Sure! Let me know how it works out, Lee Ann. Yummm. Your recipes have been killing it lately! I had a fantasy of an avocado-basil mix to spread on toast, and here is your creation. I’ve used up the avocados I had, so will have to wait til next shopping day. Sounds completely delicious! I hope it lives up to your expectations, Mary! I think it’s delicious. OMG super amazing recipe! I love it! Thanks, pal! So kind of you. This was so good! I used kale instead of basil, and added a splash of water because it was a bit too thick. Can’t wait to have leftovers for dinner. I made this recipe this morning and the result is awesome. It’s my new love of my life, and I cannot get enough of it. It’s so good! Thank you for sharing this recipe. So kind of you, Megan! Glad you loved it. Brunch is one of my favorite meals! 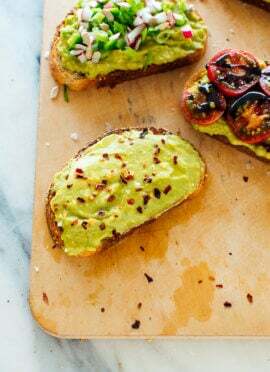 And this avocado toast looks like the perfect addition! Same here, Kelly! It’s one of those little joys in life. I hope you try the toast! I made this for a group last night (tripled the recipe for 12 people and had left overs) and it was fantastic. The eggs (I hard boiled them then chopped) really took it over the top. I’ll be really glad to keep this in my back pocket for easy breakfast/ lunch/ dinner. Thanks for another fabulous recipe! You’re welcome, Maggie! I’m so glad everyone liked it. Dear Kate, this is so delicious! I’ve never tried recipes including avocado before because I wasn’t sure I would like it, I can be a picky eater. You’re welcome, Ana! I’m so glad you tried this one. 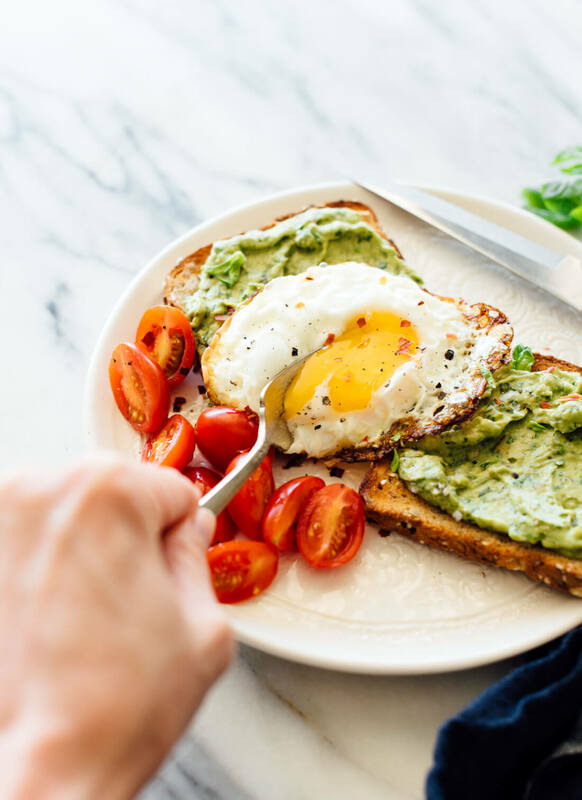 This is a killer avocado toast recipe, tried it with poached eggs and it was excellent! I wish I could attach a photo of how beautiful this came out. This breakfast is delicious! It’s easy to make, and the different flavors are incredible. 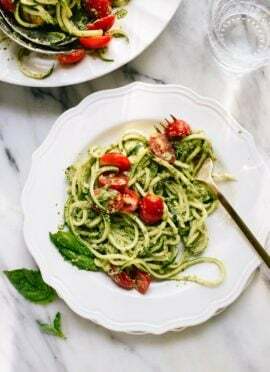 I may never make pesto other than like this again! Even my insanely picky husband (who has never eaten an over easy egg in his life) loved It! On a bit of a kick with your recipes:) But this one is INCREDIBLE. So easy, so tasty, and add ons can make it a substantial dinner for my hubby:) Thank you! Yes! This one is so easily customizable. I love getting creative with whatever I have on hand. Fabulous! Forgot to make bread ate pesto on tomato slices. Will repeat this meal over and over. This is so quick, easy and delicious! I topped mine with roasted broccoli and a little parmesan. Thanks for sharing, Susan! Sounds tasty. I love your recipes and your blog. You keep inspiring me with new ways to cook healthy food. Don’t think I’ll ever have a food blog, I’m more into websites and writing, and learning about food and cooking. I have a few recipes I come back to over and over. This is definitely one of them — it’s delectable, easy, and loaded with monounsaturated fatty acids. Great to hear! Thanks, Doug. Subbed the pepitas with pistachios and basil with cilantro – OMG!! This recipe is so delicious and easy to make. It is a welcomed addition to my egg whites and rye bread in the mornings. Sounds like a wonderful combination, Katherine!